Over recent years (2014, 2016 and now), there have been a number of extreme cold events in North America, although in different regions and of different durations. Low temperatures have been observed over much of northeastern North America during the two weeks between December 26, 2017 through January 8, 2018, and these temperatures are unusually cold in a large region centered over the Great Lakes extending to the eastern seaboard. To help us define this year’s event, we compare the coldest two weeks in the 2017/18 winter so far with the coldest two weeks in previous winters in North America. We chose this comparison, rather than using temperatures on the exact same dates in the past, because a cold wave can occur any time in winter and affects people similarly, regardless of the exact timing. We find that the coldest two weeks this winter have been 7ºF to 11ºF (4ºC to 6 ºC) colder than the coldest two weeks have been, on average, during the past “normal” period of 1981–2010 over most of the area affected by the cold wave. 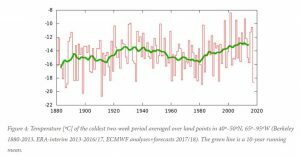 To quantify the effect of warming on the coldest two-week period of the winter in the area, we fitted the series to a Generalised Extreme Value (GEV) distribution, indicating that the temperature of the coldest two-week period has increased about two times faster than the global mean temperature rise. This has been explained as a consequence of stronger warming trends in the Arctic, where the cold air originates. The fit also shows that these two weeks are very unusual in the current climate, with a return time of very roughly 250 years in this region. The significant dependence of the GEV location on the values of global mean temperature allows us to ask what the return time of such an event was in the climate of a century ago. Our estimates indicate that a cold wave like this occurred on average every seventeen years. This means that cold waves like this have become approximately a factor fifteen less frequent due to global warming. We conclude that this was an exceptional two-week cold wave in the area in the current climate. Cold outbreaks like this are getting warmer (less frequent) due to global warming, but cold waves still occur somewhere in North America almost every winter.